The Amerock BP29203ORB Conrad 1-1/2in(38mm) LGTH Knob is finished in Oil-Rubbed Bronze. Inspired by recent resurgence of contemporary and transitional kitchen design, the Conrad collection's clean flowing lines merge with strong edges to create the perfect look for your kitchen or bath. The Oil-Rubbed Bronze finish is a rich, dark brown old world finish with striking light and dark accents. This contemporary flattened oval knob by Richelieu will give your dicor an elegant and distinctive look. Richelieu Eclectic Ceramic Knob - Plum - 31 mm Dia. This round ceramic knob by Richelieu is a classic. The knob face features a Provengal style plum motif that will enliven your furniture and cabinets. Other fruit motifs available. Add a sophisticated look to your drawers fronts with this classic knob by Richelieu. An old-fashioned influence with a bold impact. 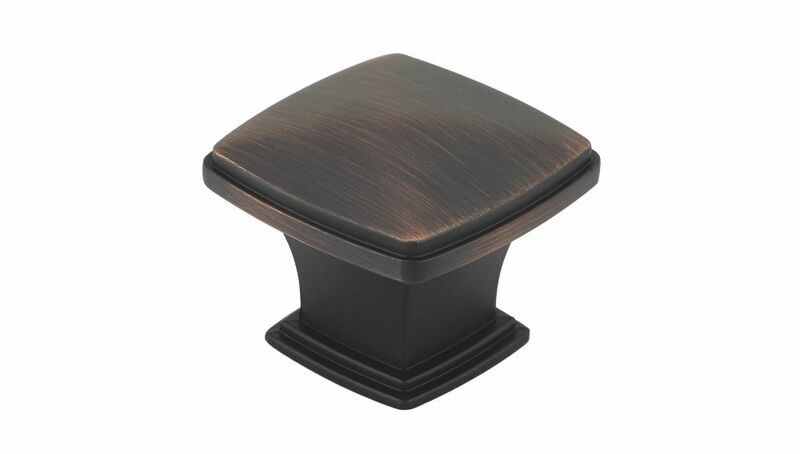 Transitional Metal Knob Brushed Oil-Rubbed Bronze - Charlemagne Collection This transitional square Richelieu knob will enhance the style of any room. Designed with a square base and finished with fine detailing around the edges. Transitional Metal Knob Brushed Oil-Rubbed Bronze - Charlemagne Collection is rated 5.0 out of 5 by 2. Rated 5 out of 5 by Marnee from Love these knobs, purchased dozens and they were all excellent... Love these knobs, purchased dozens and they were all excellent quality.